The redesigned 2014 Lexus IS will help to shake up the compact luxury sedan segment with its aggressive design, plush interior and exhilarating drive attributes and those folks eagerly waiting to put one of these new Lexus sedans in their garage can build them online now – as the company has launched the build page for the 2014 IS lineup. When the 2014 Lexus IS hits dealerships, it will be available in four basic trimlines – IS250, IS250 AWD, IS350 and IS350 AWD. The IS250 models are powered by a 2.5L mill that offers 204 horsepower and 185lb-ft of torque while the IS350 sedans are fitted with a 3.5L engine that produces 306 horsepower and 277lb-ft of torque. The IS250 pricing starts at $35,950 for the rear drive models while the AWD IS250 starts at $38,485. Those who want the bigger power of the IS350 can expect to pay at least $39,465 for rear wheel drive and the IS350 that spins all four starts at $41,700. Regardless of which of the four trimlines for the 2014 Lexus IS sedan is chosen, buyers can pick from eight exterior colors and five interior shades – all of which are available with no additional fee. Once you have chosen your ideal trimline, interior color and exterior color, the 2014 IS configurator varies a bit depending on the trimline chosen. Those prospective buyers who are considering the 2014 Lexus IS250 can pick from three option packages – the Navigation Package, the F Sport Package and the Luxury Package – with small variations of the F Sport and Luxury packages making for a total of five option packages for the base IS250. When you step up to the 2014 IS250 AWD sedan, there are technically 11 option packages including the Premium Package, three different Navigation Packages, the F Sport Package and six different Luxury Packages with the price of those packages starting at $2,468 and continuing up to the top of the line Luxury Package that will set you back $7,318. Those who are leaning towards the 2014 Lexus IS350 in rear drive form get only three option packages in the form of the Navigation Package and two slightly different F Sport Packages while the 2014 Lexus IS350 AWD sedan has six option packages of its own – the Navigation Package, two F Sport Packages and three different Luxury Packages with pricing ranging from $4,803 to $7,215. Once you have selected the trimline and option packages in the 2014 Lexus IS configurator, you are directed to pick from a collection of accessories that are uniform across the four different trimlines. This short list includes items like a cargo net, remote start, a Lexus rear bumper appliqué wheel locks and unique 18” alloy wheels. Were I to build my ideal new IS sedan – having had the chance to drive the full lineup on both a closed circuit and the open road – I would opt for the 2014 Lexus IS350 RWD sedan. While the AWD setup might be great for those who need it, I do not so I would rather not have the weight adding features of the advanced all wheel drive system. 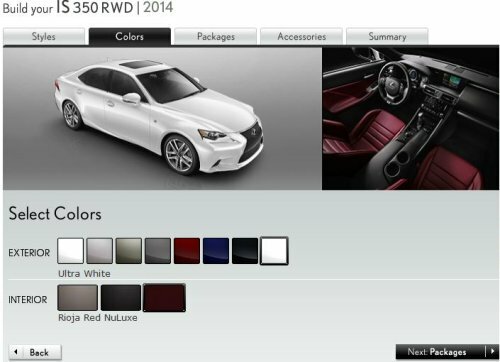 My 2014 IS350 would be Ultra White on the outside with the unique Rioja Red interior package. I prefer the Matador Red Mica exterior paint with a black interior but the build site doesn’t allow you to configure the IS350 RWD with the F Sport package in that exterior color and in the long run – I’d rather have a white F Sport than a dark red “base model”. Next, I would opt for the F Sport package that includes the incredible Mark Levinson Sound system along with all of the other goodies of the IS350 F Sport package which adds $7,921 to the final price – but it is well worth it. I would also add the remote engine starter and the optional wheel locks which combine to add another $572 to the final price. In the end, my beautifully equipped 2014 Lexus IS350 would carry a price of $48,853 including the F Sport Package, the wheel locks, the remote starter and the $895 destination fee. That really isn’t a big price tag for a car that delivers so much luxury and so much fun to drive factor with enough room to comfortably seat four adults. You can click here for my first drive piece on the 2014 Lexus IS where I look at the newest compact sedan compared to the outgoing 2013 IS. Click here to head over to the Lexus webpage to build your own 2014 IS sedan!